Today more and more people are spending time indoors. They don’t understand there are many health benefits to staying active and spending time in nature. The Smokies are the best place to break this habit. The mountain views are so beautiful you can’t help but want to be outside. Staying active is just one way white water rafting in the Great Smoky Mountains with Smoky Mountain Outdoors can help benefit your health. At Smoky Mountain Outdoors, our white water rafting season is starting to come to an end. We have transitioned from “massive rapids” type trips to more natural flow trips. You can still spend time on the water and get a peaceful experience on your weekend getaway. Getting to see the gorgeous fall foliage is just one reason you don’t want to miss out on white water rafting in Gatlinburg with us. Summer is coming to a close and temperatures are cooling down which means it is almost time for fall break. At Smoky Mountain Outdoors, we are transitioning from “massive rapids” type trips to natural flow trips down the river. It’s an experience that everyone should try at least once in their lives. 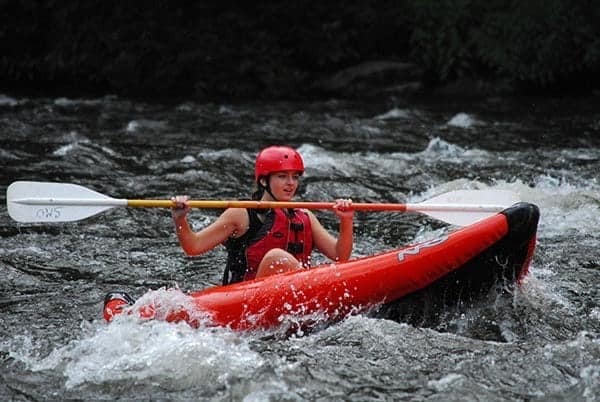 These natural flow trips are based on the water levels, but they’re still fun if you’re looking for whitewater rafting near Gatlinburg during fall break.